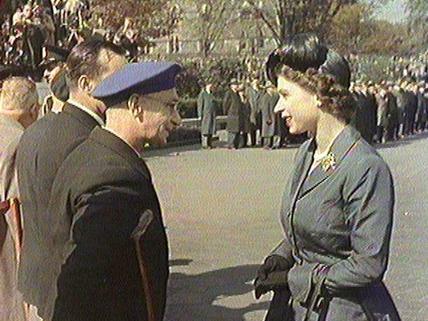 Also known as "Voyage royal"
"A documentary account of the five-week visit of Princess Elizabeth and the Duke of Edinburgh to Canada and the United States in the fall of 1951 includes the pageantry of Québec City; the National War Memorial in Ottawa; the Trenton Air Force Base; Toronto; a performance of the Royal Winnipeg Ballet; Regina; Calgary and Edmonton. The royal train crosses the Rockies and makes stops in several small towns. The royal couple boards the HMCS Crusader in Vancouver and watches native dances in Thunderbird Park, Victoria. They are then welcomed to the United States by President Truman. The remainder of the journey includes visits to Montreal, the University of New Brunswick in Fredericton, a steel mill in Sydney, Nova Scotia and Portugal Cove, Newfoundland." "Everyone involved knew that shooting [Royal Journey in colour would greatly enhance its value and guarantee greater exposure in Canada and throughout the world. The problem was, apart from the costly Technicolor process, there were only a few inferior colour systems available. Technicolor was ruled out as it required the use of very bulky cameras as well as specially trained film crews. The NFB would not be able to use its own cameramen. The biggest problem however, was that Technicolor required bright sunshine or very powerful lighting to have any chance of looking good. The weather in Canada in the fall is very unpredictable and it is rare to have bright sunshine for long stretches and setting up bright lights during the tour was a logistic impossibility. NFB cameramen had heard of an experimental 35 mm film stock that Kodak was developing (Eastman colour) which was supposed to give true colours even during overcast or rainy days. The NFB contacted Kodak and filmed a couple of tests which everyone thought quite satisfactory"
"Royal Journey, the NFB's record of Princess Elizabeth's Canadian tour in the fall of 1951, will always be remembered for being the first feature film ever shot on Eastman colour 35mm film stock. It was originally to be a 20-minute newsreel but the NFB had shot a lot of good material and was not sure what to do with it. The president of Famous Players cinemas, J.J. Fitzgibbons, was asked to look at the 60-minute rough cut of the film and advise the editors. He told them to cut nothing out, and that he would gladly show the film in his theatres on one condition: that it be ready for a Christmas release, just one month away. NFB employees worked day and night to complete the film on time. Columbia Pictures premiered it on December 21, 1951, in Ottawa and then released it throughout Canada. After only 3 weeks it had grossed $250,000 in Canada alone. It was released in New York City by United Artists in January of 1952 and played throughout the USA. Royal Journey was, at the time, the most widely seen feature film in Canada, ever -- 2 million Canadians saw it in the first 3 years of release." National Film Board of Canada. "NFB -- Royal Journey." National Film Board of Canada. http://onf-nfb.gc.ca/en/our-collection/?idfilm=11797. Ohayon, Albert. "NFB -- Royal Journey: The National Film Board's First Major Hit." National Film Board of Canada. http://blog.nfb.ca/blog/2010/10/04/royal-journey-the-national-film-board%E2%80%99s-first-major-hit/.